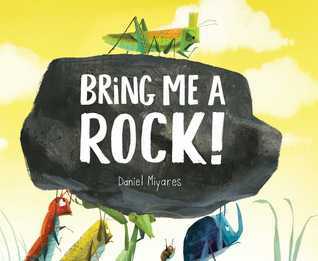 Geo Librarian: PICTURE BOOK REVIEWS: A Big Surprise for Little Card/Bring me a Rock! PICTURE BOOK REVIEWS: A Big Surprise for Little Card/Bring me a Rock! In the world of cards, each one has a special job to do. Big Card keeps important papers in order. Tiny Card can be exchanged for a prize in an arcade. Round Card hangs out in a glamorous boutique. But is any card as lucky as Little Card? He’s going to school to become a birthday card — in other words, to sing, play games, eat cake, and be happy all day long. But wait! On the day he’s supposed to take his talents into the world, Long Card tells him there’s been a mix-up and they need to trade jobs. 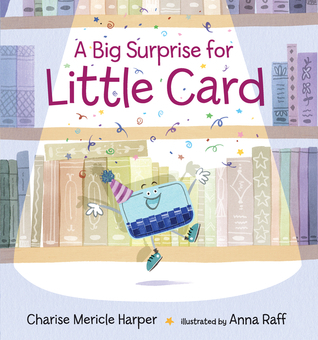 How can Little Card bring his exuberance into a library, a quiet place of books and rules and hushing? Offbeat and utterly endearing, this tale of a little guy who gives it all he’s got is complete with a sweet twist and a surprise ending. Little Card is a delightful young fellow who is thrilled when he gets a letter telling him it's time to train for his future job as a birthday card. He enjoys singing, and dancing, and shouting, "Happy Birthday!" Unfortunately, it turns out that he got the letter intended for his friend, Long Card. Little Card ends up as a library card and discovers that it's just as joyful as being a birthday card. I thoroughly enjoyed reading about Little Card's adventures with his new friend, Alex. For librarians like myself, this is a great book for encouraging children to find books they enjoy, show them the library can be a delightful place, and to treat books with respect. A couple of little songs also add some music to this fabulous read a loud. The illustrations are fun and lighthearted and add the perfect touch to this sweet story. From the author-illustrator of Pardon Me! and Float comes a funny and fun picture book about a little bug who proves that even the small can be mighty. Bring Me a Rock! feels an awful lot like a fable about the dangers of being greedy and power hungry versus the value of even the littlest 'bug'. The rude grasshopper orders the other bugs to build him a tower fit for a 'king'. But when the littlest bug shows up with a pebble he is summarily rejected. But when the grasshopper ends up in trouble, it's the littlest bug who steps up with a big solution. Miyares illustrations are the real stars here as he uses the power of size and perspective to emphasize the differences in power and influence. The facial expressions and the use of color are masterful as is the changing text and shape of the rock. The young readers will undoubtedly figure out that the grasshopper's in trouble without any words being said. This book does have words, but it's the pictures, the visuals, that really tell the story here. This book makes for an interesting read, a great teaching opportunity, and an award-worthy picture book. Bring Me a Rock sounds like a great book to pair with Yertle the Turtle! PICTURE BOOKS FOR BACK TO SCHOOL! FANCY NANCY TEA PARTIES Review and GIVEAWAY!